From July 2018, I am working with colleagues from RMIT's School of Design - industrial designers Juan Sanin and Liam Fennessy - in a $46k collaborative research partnership with Bendigo Hospital to develop a sensory trolley for use by Psychiatric Services. The trolley will help clinical staff to conduct mobile multi-sensory experiences to improve the wellbeing of staff and patients within the hospital, and help build skills in patients in their lives outside the hospital setting. The new research partnership builds on the existing 'Design for Wellbeing' project led by DERC's Sarah Pink and School of Design Dean Laurene Vaughan. This project uses ethnographic, sensory and visual techniques to investigate how people experience two important commemorative days in Australia: Anzac Day (25 April) and Remembrance Day (11 November). The project team - Shanti Sumartojo (RMIT University), Danielle Drozdzewski (University of Stockholm) and Emma Waterton (University of Western Sydney) - will focus on Melbourne and Canberra, investigating how people make sense of and perceive national commemorative events and what meanings are ascribed to them. This project forms part of a wider international investigation of 11 November 2018 called Commemoration Reframed that Shanti is leading in 2017-2019. The crowd disperses at the end of the Dawn Service at the Shrine of Remembrance, Melbourne, 2015. The Exchange at Knowledge Market is a 12-month research partnership between LendLease and RMIT University based at Victoria Harbour in the Docklands. 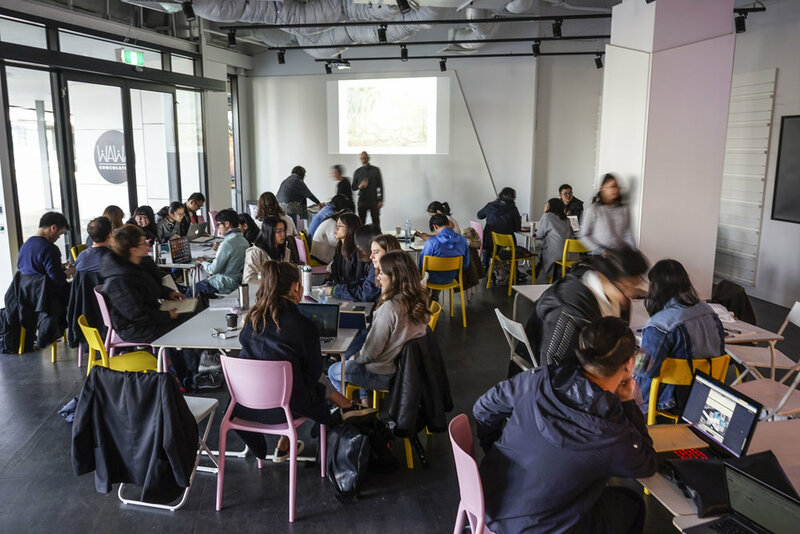 It sees a team of RMIT designers, social scientists and students embedded in the site, leading a series of design studios, research projects and public engagement activities. It is a living laboratory, taking advantage of a unique moment in the development of Victoria Harbour to investigate questions that apply to urban environments around the world. The Exchange at Knowledge Market is also a prototype for community engagement that can be adopted in different ways by governments, councils, developers and communities around the world. A full year of RMIT student studios that investigate and design for urban futures, using Victoria Harbour as a living lab for their work. A series of linked design ethnography research projects that focus on what makes a sustainable, diverse and digitally connected community. This will include asking local residents and workers how they understand and experience the precinct and what their aspirations are for Victoria Harbour, and the development of design installations to explore these further. A schedule of public workshops, forums and other events that will engage directly with the community, and that will bring a range of experts to speak on some of the challenges facing cities today. Students tackle Victoria Harbour in The Exchange at Knowledge Market. In the first half of 2017 I led the team (Joanne Mihelcic, Bianca Vallentine, Sarah Pink and photographer Nick Walton-Healey) investigating how the atmosphere of Queen Victoria Markets is linked to how it is designed. This work, funded by the City of Melbourne, will contribute to planning the refurbishment of the site, a major 5-year project starting in 2017. The final report, which we delivered to the City of Melbourne in June 2017, is available here. Smoke rises at the Summer Night Market, Queen Victoria Market, Melbourne. Photo credit: Nick Walton-Healey. In early 2017 I collaborated with Sarah Pink and Melisa Duque on the ethnographic component of the industry-funded project Acoustic design innovations for managing motorway traffic noise by cancellation and transformation. This was led by Dr Jordan Lacey of the RMIT School of Architecture and Design and funded by Transurban, and researched how innovative electronic sound transformation technology might shape how people experience motorway noise in their local communities. The report is now available here. A visitor enjoys the sound transformation in Charles Evans Reserve, Richmond. In late 2016 I was a Fondation Aix-Marseille Université Visiting Fellow at the Laboratoire d’Études et de Recherche sur le Monde Anglophone (LERMA). During my visit I worked with Dr Matthew Graves on a research project based at the Camp des Milles, to investigate visitors' encounters with the site and its digital elements. Journal articles based on this work are currently under review. A room in the museum section of the Camp des Milles near Aix-en-Provence, France. In 2016-2018, I am part of the team conducting a design ethnography in the Psychiatric Services Unit of Bendigo Hospital. With RMIT colleagues Distinguished Professor Sarah Pink and Professor Laurene Vaughan, I am investigating how staff, patients and visitors experience the design of the existing wards in 2016. In 2018, we return to the new hospital building for the second part of this innovative study. Design for Wellbeing is a research partnership with Bendigo Hospital and Exemplar Health and was launched in August 2016, with media coverage that included the Bendigo Advertiser and the ABC. A patient at Bendigo Hospital indicates a favourite chair in his room.